To simply describe John Corey Whaley’s debut novel as an original, contemporary coming-of-age story about growing up in a small town would not even begin to cover things. It is a heartbreaking read and a hopeful read at the same time. It is a story about brothers, and it’s about the pursuit of the meaning of life. Winner of the Printz and Morris awards, Where Things Come Back by John Corey Whaley is a phenomenal novel about hometowns, loss, and second chances. The book follows Cullen Witter the summer before his senior year. Unimpressed with everything about his small town, Cullen cannot wait to leave. That summer, Lily, Arkansas, is put on the map when a man causes a stir by claiming to have seen a Lazarus Woodpecker — which were thought to have been extinct since the 1940s. The town is thrown into a media frenzy over the bird, and at the same time Cullen’s sensitive and highly intelligent brother, Gabriel, inexplicably goes missing. With the alleged reappearance of the woodpecker, the town’s absurd obsession with the bird seems to block out all coverage regarding Gabriel’s disappearance. In between the chapters of Cullen’s story, a second narrative follows Benton Sage, a young disillusioned missionary working in Ethiopia. Every other chapter tells of Benton’s journey as he looks for a greater meaning of life. In the end, the two narratives come together in an unexpected way that will boggle your mind. Before anything else, the book is about brothers. The scenes between Cullen and his brother were beautiful to read, and Cullen and Gabriel’s relationship deeply affected me right off the bat. Gabriel is the ideal younger brother. He is very gifted, easy to talk to, and gets along with nearly everyone. Sibling love is not something often found in the Young Adult genre, which made this story very refreshing. The town of Lily, Arkansas, is its own character in the book. Whether it is loyalty to the town itself or family ties, the pull of one’s hometown seems to be a universal experience. Everyone who leaves Lily eventually comes back. Cullen fears this pull as he longs to escape his dull hometown. The town also represents the hope that things can come back. The people of Lily, Arkansas, fully embrace the Lazarus Woodpecker because it represents the idea that things you once thought lost, or extinct, can come back. They can in Lily, Arkansas, and Lily becomes a place that believes in second chances. The writing style is both clever and creative. The themes of loss are paired with a good sense of humor. 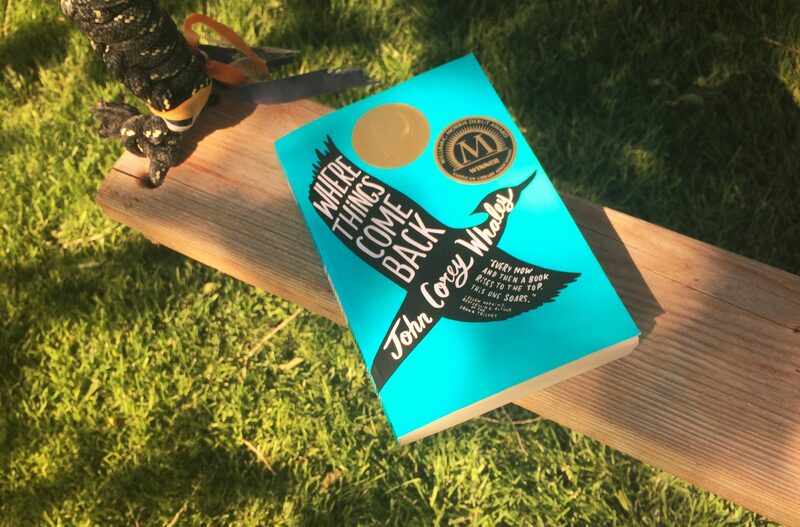 Although I could compare Whaley’s writing to John Green, Where Things Come Back is an extremely original storyline. The flip between the two narratives is deliciously jarring. Although some might find the jump between the two stories odd, I found it both enticing and refreshing. At the end, how the two narratives eventually connect blew my mind. Where Things Come Back is a great novel. It is charming as well as thought-provoking. Throughout the book, Whaley develops a powerful intensity that will creep up on you. It is a deeply impactful read. I highly recommend it to everyone looking for something different to read. Mary is a mermaid in training. She is a proud glitter enthusiast, hopeless slushy addict, and avid nail polish collector. Old songs and old movies are her favorites. If she is not on some crazy adventure, you will find her with her nose stuck in a book. Every day she attempts to do at least one thing that scares her.